San Diego has so much to offer and so does ForeverFiances Celebrations! Great invitations that are truly unique and will help your son stand out while he stands up and becomes a man! 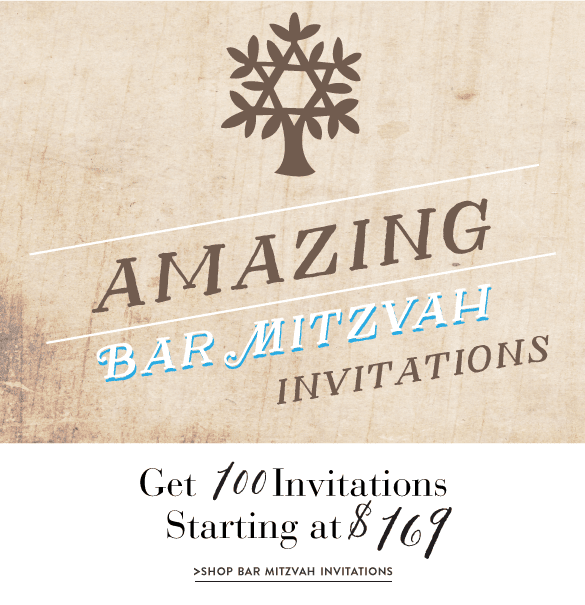 Bring the sun and fun to your son's birthday extravaganza with one of our outstanding Bar Mitzvah invitations. Check out our different themes, one is sure to peak your son's interest: stars, space, chalkboard, trees and more. The exciting outdoors is every boy's playground and San Diego has the terrain and weather to explore all year round! 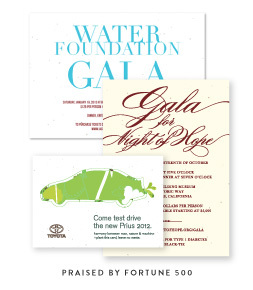 We offer our invitations on unique plantable paper, embedded with wildflower seeds (also garden herbs on desert brown and bright green paper), as well as on premium 100% recycled paper. We have lots to choose from and are constantly adding new designs to our collection, bringing you the best selection on eco-friendly materials that you can find. The Star of David is a very important symbol in the Jewish religion and traditional celebrations will include some decorations of this popular icon. It is known in Hebrew as the Shield of David. It is in the shape of a hexagram, combining two triangles. 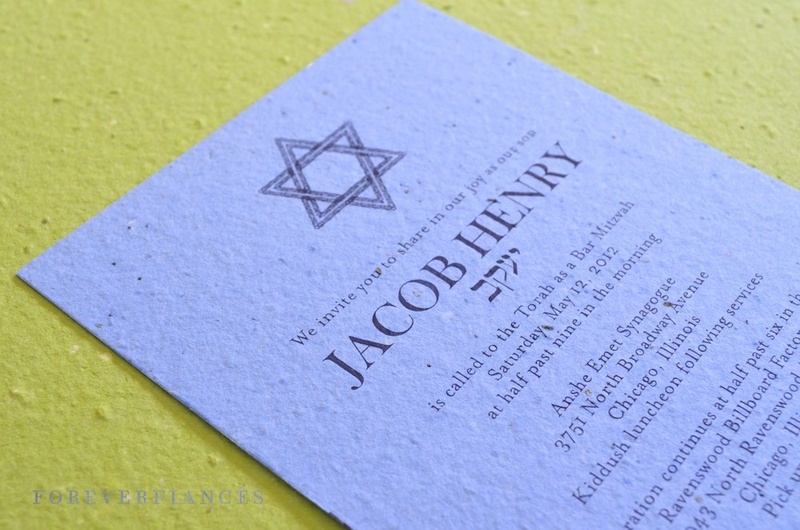 Having a classic symbol of Judaism printed on our plantable paper will help create the most memorable bar mitzvah invitations your guests will ever receive. Boston does just that, it is a simple design with the Star of David stretched out to create a border for your text. The Star is widespread and takes up the entire card, just as San Diego County stretches vast and encompasses the shore, mountains and desert. Make your son's birthday everlasting with the Eternal Star invitations! Invite your friends and family as he takes on the sacred responsibility to cherish the Jewish ritual law and ethics. This delicate invitation will catch everyone's attention and they'll remember this special day for years to come. San Diego has the best weather you can imagine, it is often said to have an eternal summer. Add some greenery and garden flair with our Natural Star invitations, printed on handmade plantable paper. It includes a charming border, giving the illusion of a picture in a frame. Choose your favorite seeded paper color! San Diego was originally a desert until settlers came and added all the greenery you will find here today. Now it looks like a tropical paradise! Flag down your friends and family for your son's bar mitzvah with these fun invitations! Star of David Flag is the national flag of Israel, the birthplace of Judaism. These cards are bright and beautiful, customizable with your own color choices to match your religious celebration. 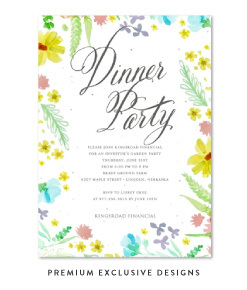 They are also available on our unique All-in-One format, that includes a detachable RSVP card, ready for mailing! In a fast paced city like San Diego, you're guests will appreciate this unique format, to save them time and make their life a little easier. 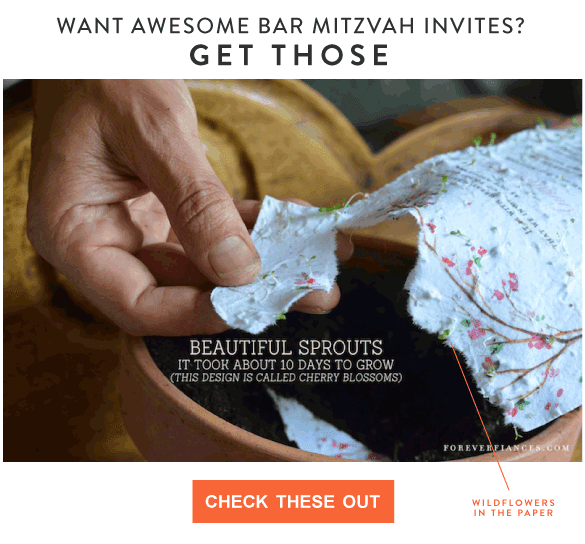 This invitation is a true delight, illustrated with multiple stars of David. 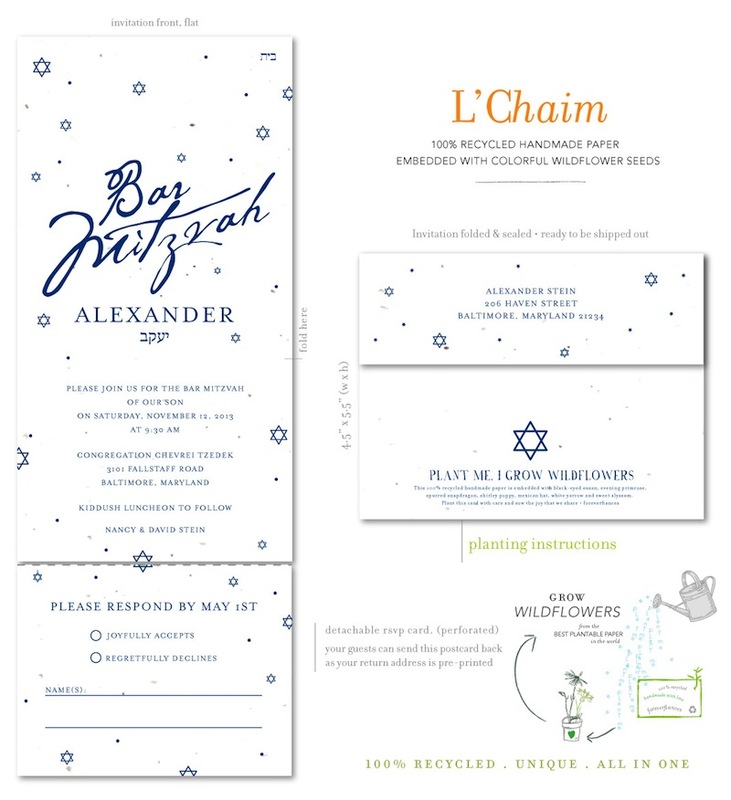 L'Chaim is another one of our great invitations on our extraordinary Send n Seal format. Forget building a suite, this has everything you need, except matching thank you cards ;) Be sure to thank all who attended your son's birthday celebration. 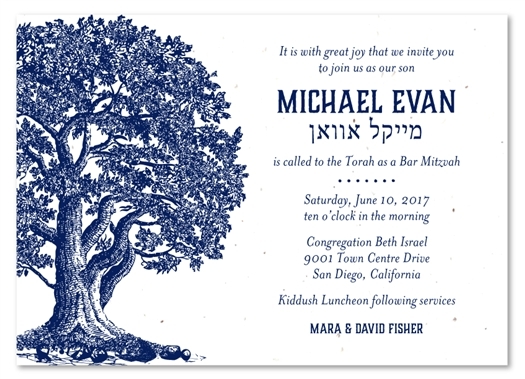 ForeverFiances is known for their wonderful tree wedding invitations and has taken some of their popular designs and tailored them for bar mitzvah ceremonies. Balboa Park hosts hundreds of different trees, the biggest collection in San Diego. If your son's birthday is in September and he enjoys climbing trees, hiking, and being in the forest then we have an invitation that will suit his style. This design is perfect for any event held in sunny San Diego! September Birch displays a beautiful watercolor birch tree and continues to be a favorite. Matching RSVPs, Insert, and Thank You cards are available. Vieux Oak is one of our best selling wedding invitations and we are hoping your son will want to use these invites for his bar mitzvah! 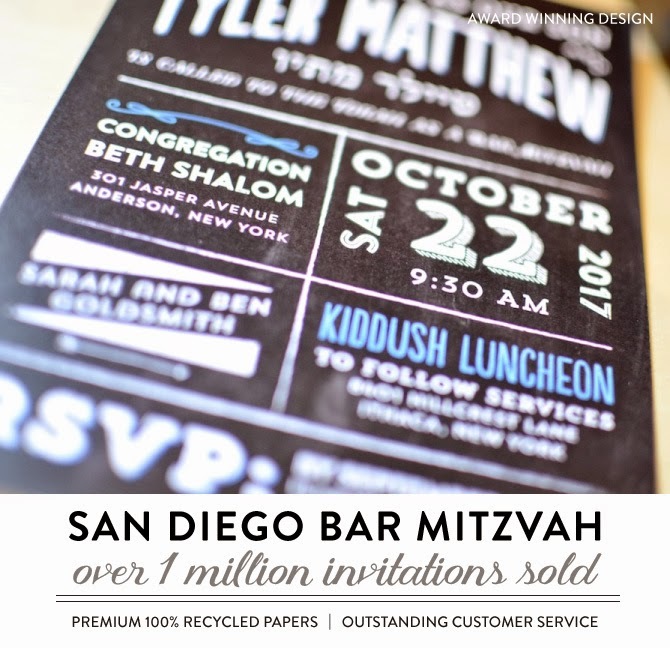 Celebrate this momentous occasion in a fun and timeless way with these rustic bar mitzvah invitations. A big strong oak tree representing a boy becoming a man, is a great design for a bar mitzvah. San Diego is full of oak trees, if you look in the right places. 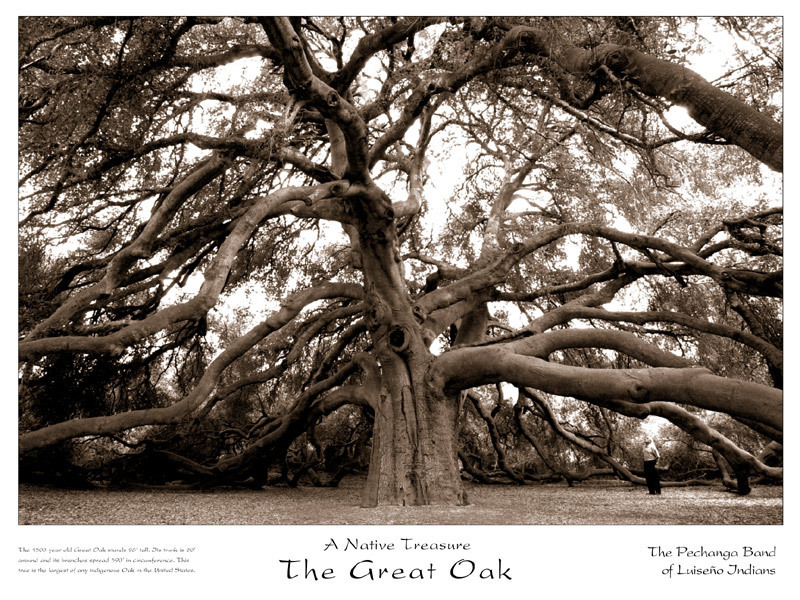 Temecula is home to the Great Oak Tree. Our Millennium Tree represents the tree of life, where we all came from. Burnt Orange and Forest Green are good color selections for a young man. Still fun but more manly! 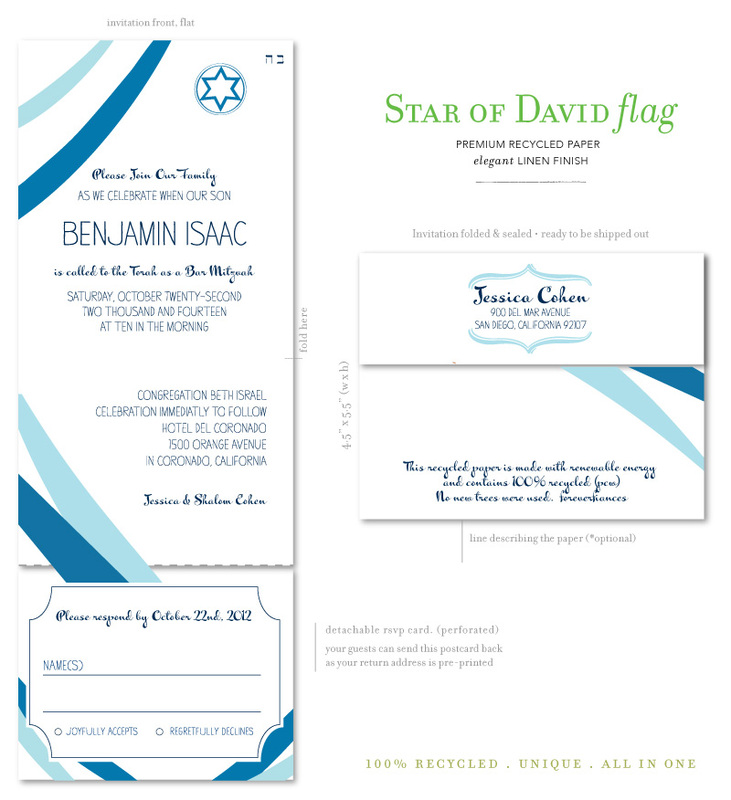 The striped star design on the back ties in the Jewish theme for these bar mitzvah invitations. You won't find this tree in San Diego, or any other city. This mythical tree brings happiness to all. La Foret has been awarded best invitation on our site in 2011 & 2012. It was also voted best tree invitation numerous times. This classic invitation will be sure to capture the excitement of his eco-friendly bar mitzvah. It is hard to find a forest in San Diego, but hiking through Torey Pines may remind you of the Midwest. Travel to the mountains surrounding San Diego, to have a rustic celebration and party as loud as you want! Our Mountain Lodge invitation will get your guests ready for a fun, relaxing weekend at lodge or chalet. A polished wood background completes this lovely tree invitation, perfect for your son's special birthday! Our collection of San Diego Bar Mitzvah invitations can't be complete without a Palm Tree invitation! Paradise Island is decorated with watercolor palm trees, a beautiful invite. Escape to a tropical paradise on your son's special birthday and discover the man he will soon become. Available on our unique plantable paper, handmade and embedded with wildflowers seeds. We have combined the famous Star of David with the Tree of Life to create the Star Tree! We took these two classic Hebew symbols and brought them together to create a popular invitation just for Bar Mitzvahs. As we end the selection of my favorite tree invitations, we will move on to the next category, Star Bar Mitzvah Invitations. ForeverFiances has started launching chalkboard wedding invitations this year and we have created an invitation just for bar mitzvahs! This fresh and stylish design is called Modern Chalkboard. By time your son has his own children, chalkboards may be a thing of the past! Pacific Beach has a unique deli that will remind you of the East Coast, if you've ever had delicious sandwiches over there. 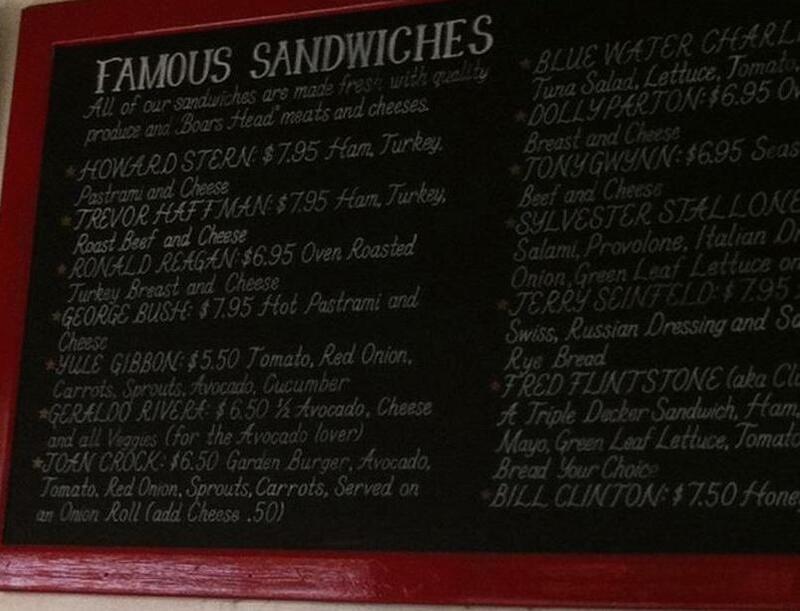 The Chalkboard Deli is highly recommended by locals and tourists alike! Another new fun invitation we launched this year, specifically for bar mitzvah celebrations is the Night Sky. Illustrated with the dreamy milky way galaxy, encompassed by distant stars, this is perfect for your son's space themed birthday. It is already becoming a big hit so order now so you can stand out before someone else does! If you want a memorizing view of the stars head up to the mountains in Julian or Palomar at night. 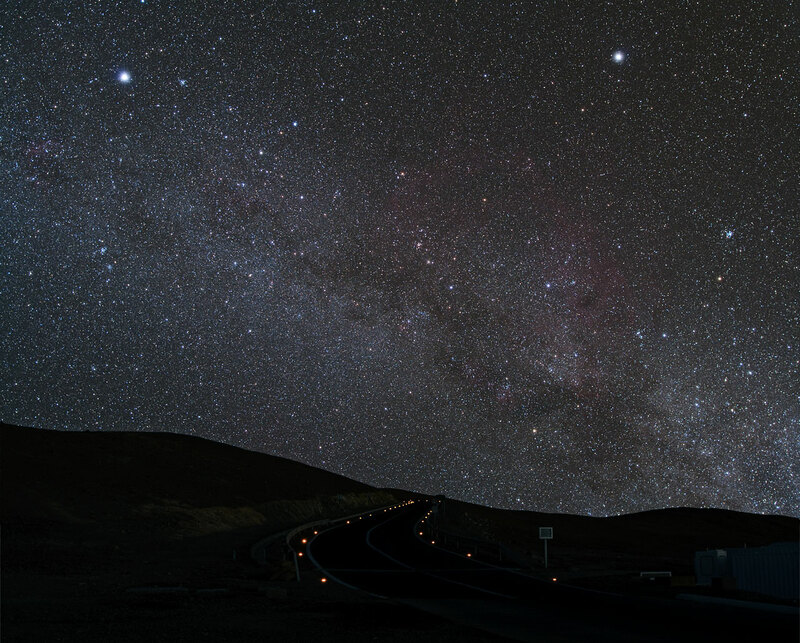 You'll be astonished by how bright the night sky actually is!